Stir Fry Kale – A quick and easy side dish that pairs with almost anything. 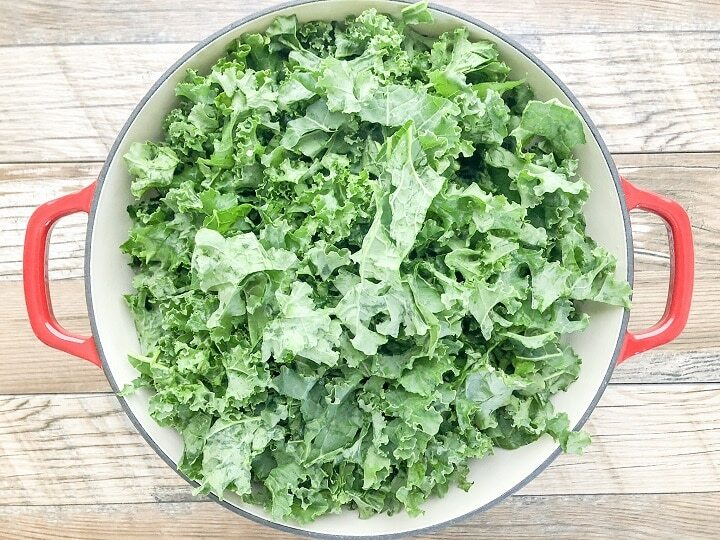 I have to say that kale is one of our favorite leafy greens and lately I’ve been putting it in many of our dishes. It’s delicious, healthy, and very economical. It’s great when added to soups, pastas, salads, or even on its own as in this Stir Fry Kale. If you’re struggling with ways of adding more green leafy veggies into your diet, you can’t go wrong with kale. Kale is a super-food that’s packed with an abundance of nutrients, such as vitamins K, A, C, and magnesium. This popular health food is low in calories, high in fiber and contain zero fat. The health benefits of kale are limitless and is a great food of choice to manage or ward off certain illnesses or ailments. Today, I thought I would take a few minutes to share this really quick and easy Stir Fry Kale recipe that you could whip up to go along side your main dish this weekend. So hopefully I’ve caught you just before you leave for your weekend trip to the grocery store. So, if you haven’t ever purchased kale before, challenge yourself to cook with kale this weekend. I think you’ll be glad that you did. So don’t be shy – grab some bunches of kale and use it in a recipe this weekend. As a side note, kale is similar to spinach and other green leafy vegetables in the sense that it cooks down to barely nothing. For example, when making Stir Fry Kale, you’ll notice that your saute pan is full of beautiful green leafy kale; however, as the leaves begin to wilt the serving size gets small. I would recommend that you’re mindful of this and the number of people you’ll be serving. 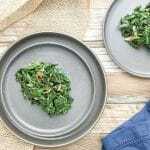 Type of Kale: There are different types of kale, but for this recipe, I used curly leaf kale which is the most common type of kale found at local grocery stores. Its leaves are curly hence the name, and the stems are very fibrous and should be removed before cooking. Prior to stir frying the kale, remove the stems and discard, give the kale a rough chop and wash the kale extremely well. Sometime, I even use a fruit and vegetable wash when I have it on hand. Aromatics: If you’re looking to take your Stir Fry Kale to the next level, it’s a must that you saute a combination of fresh minced garlic and sliced shallots. 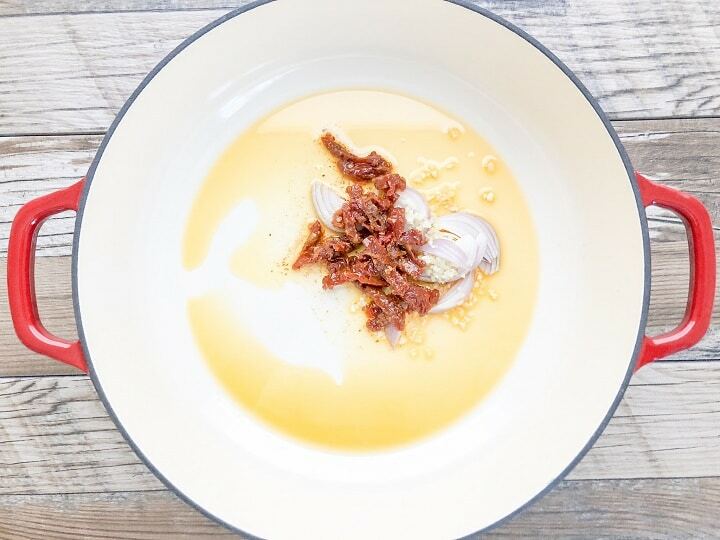 The release of the aromatics once heated adds a wonderful flavor and delightful taste. Extra virgin olive oil is a healthy oil with a low smoking point which makes it an ideal oil for cooking food that doesn’t require a lot of cooking time. Note: Sun-dried tomatoes are optional but recommended if you have some on hand. If not, don’t worry you’ll still love the taste. Literally speaking, Stir Fry Kale takes 3 to 5 minutes to cook. It’s done when the leaves start to wilt. But, be careful of not overcooking as you still want the leaves to have a slight crunch. If you’ve never cooked with kale or haven’t in a while, I think you’ll love this quick and delicious Stir Fry Kale recipe. It’s the perfect weekend or weeknight side dish. 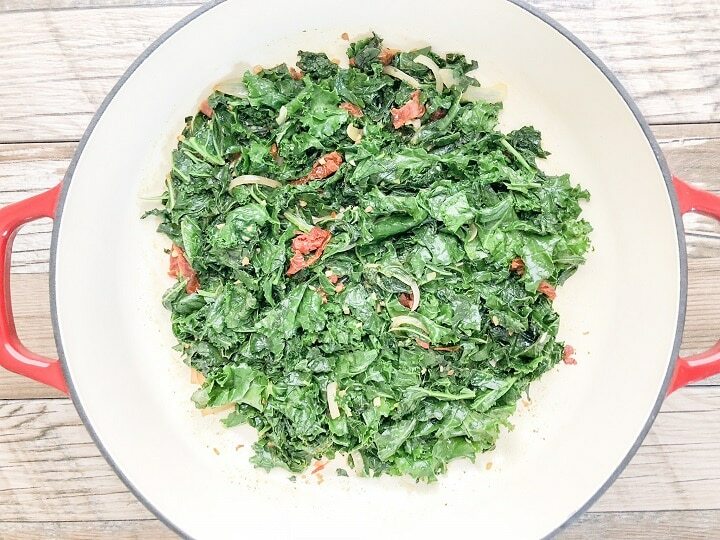 Stir Fry Kale - A healthy and delicious side dish made with just 5 ingredients, kale, fresh garlic, shallots, sun-dried tomatoes, & kosher salt. Remove the stems from the kale, give the kale a rough chop, wash the kale really well and dry with paper towel or a salad spinner. Set aside. Minced garlic cloves, thinly slice half of one shallot, and sun-dried tomatoes. Set aside. Add extra virgin olive oil to a saute pan over medium heat. Add garlic and shallots and saute until just until fragrant. Add kale. Using a spoon, begin to move the kale around frequently until it begins to wilt about 3 to 5 minutes. Add salt to taste. Instead of a shallot, you can use an onion. Do not use too much onion as you do not want the taste of the onion to over-power the kale.